EasyRead Time Teacher's simple 2-step teaching system really works. Try it yourself now: Step 1: Read the number at the end of the short hand. Step 2: Read the number at the end of the long hand. Like this - '1:51'. It's that simple! 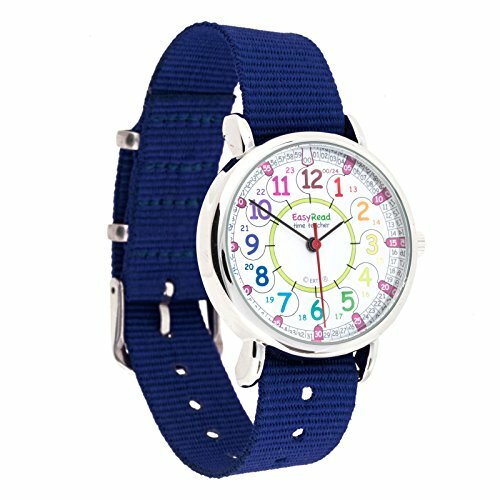 EasyRead Time Teacher children's time teacher watch, 1.3" diameter, with multi-colored face, navy blue fabric strap and metal buckle. Designed to help children learn to tell the time in terms of 12 & 24 hour time, for example '1:51' or '13:51'. Supplied with simple 2-step teaching system instructions, easy to learn, compatible with the EasyRead Time Teacher 12 & 24 hour digital clock. Battery operated, Seiko PC21s movement, stainless steel back, durable IPS plating (non allergenic). Battery included. Washable fabric strap, 0.6" wide by 8.5" long. Fits wrists from 4.7" to 7" circumference (small child to medium adult). If you have any questions about this product by EasyRead Time Teacher, contact us by completing and submitting the form below. If you are looking for a specif part number, please include it with your message. Pokemon Pikachu Gift Set for Kids.Quartz Analog Wrist Watch,Shoulder Plush Toy Bag,Drawstring Bag.